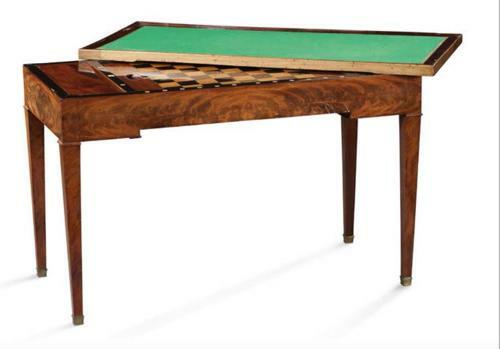 A GOOD LOUIS XVI PERIOD MAHOGANY TRIC/TRAC TABLE,THE REVERSIBLE TOP WITH A LEATHER WRITING SURFACE TO ONE SIDE, GREEN BAIZE TO THE OTHER. THE INTERIOR WITH A NATURAL & GREEN STAINED IVORY INLAID BACKGAMMON BOARD. A BOXWOOD INLAID REMOVABLE CHESS BOARD IS STORED BELOW & CAN BE INSERTED ABOVE THE BACKGAMMON SURFACE. FRENCH C.1790 INCLUDING A SET OF COUNTERS.